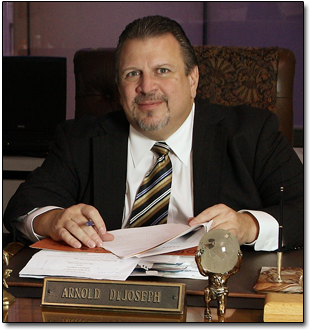 Arnold E. DiJoseph is a seasoned litigator with over 20 years extensive experience as a trial and appellate attorney. He has never shied away from difficult cases and, as a result, has achieved success in many cases that other attorneys had turned down. He has personally handled hundreds of motor vehicle accident cases as well as those involving incidents on all types of private and public property. In addition, he has been involvedin numerous personal injury and wrongful death cases arising out of medical malpractice, products liability, construction accidents, exposure to toxic substances, and defective medical devices and pharmaceutical products. He has also developed complete familiarity with such diverse areas of the law as Workers’ Compensation, adoptions and custody proceedings, and nursing home negligence and abuse. In addition to his abilities as a litigation and trial attorney, however, Mr. DiJoseph has become one of the most respected appellate attorneys in New York State. As a result, he has handled hundreds of state and federal appeals for his own clients and for an ever-growing number of other attorneys. Mr. DiJoseph is especially seasoned in is litigation involving other attorneys. This ranges from defending attorneys against disciplinary complaints to representing law firms in disputes with other firms over the distribution of legal fees. He also has handled a significant number of legal malpractice claims where clients have found it necessary to sue their attorney for serious errors, which have caused their cases to be lost or dismissed. Our firm is dedicated to fighting for the maximum recovery possible in every case. In order to accomplish that, we have assembled a staff that is committed to our clients and seeing to it that they are always kept fully informed of everything that is going on in their cases. Whether it is helping with No-Fault insurance forms, filing for disability or Workers’ Compensation benefits, or explaining what each step in the litigation process means, our paralegals, investigators, legal secretaries, and attorneys always take the time to make our clients feel as if their case is our only case.